*I'm having a couple of cause-themed days here on the blog. Timing....what are you gonna do? **I am participating in Blog Action Day 2013. The theme is Human Rights. I submit the following for your consideration. How often do we contemplate the issue of Human Rights? I'm not sure I do all that often. Which seems funny to me since I am a human and I don't want anyone to take my rights away. But I am an American, and as such I probably take my rights and freedoms a bit for granted. Also, I don't watch the news very often so I'm not hearing about every human rights violation that happens around the world. I don't have my head buried in the sand, though. I do know people's human rights are threatened all the time. Still. 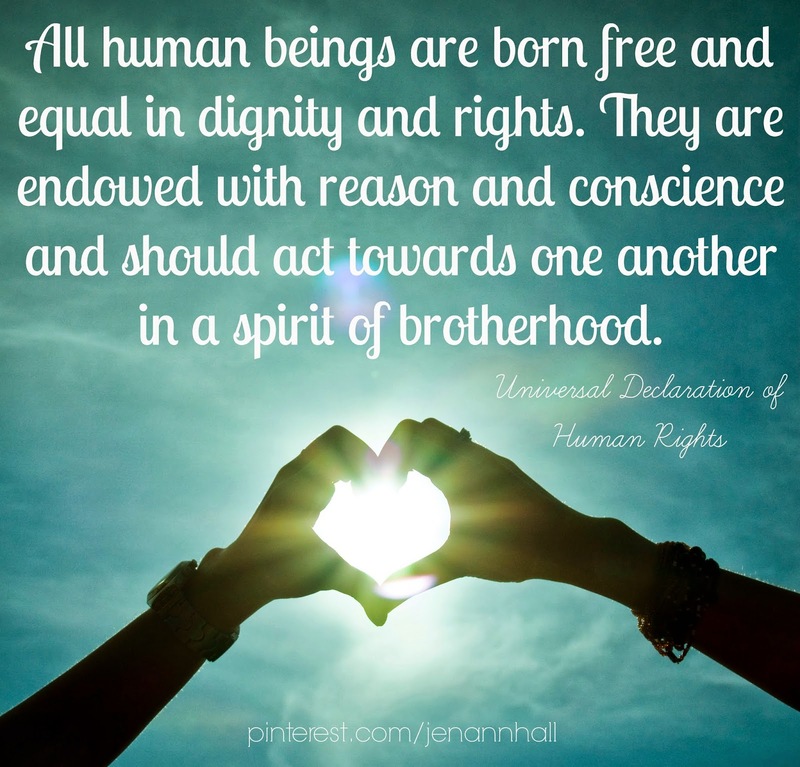 A "human right" is a right that is believed to belong justifiably to every person. "The United States has a vibrant civil society and media that enjoy strong constitutional protections. The victims of abuse are typically the weakest and most vulnerable in US society: immigrants, racial and ethnic minorities, children, the elderly, the poor, and prisoners." "The US incarcerates more people than any other country. Practices contrary to human rights principles, such as the death penalty, juvenile life-without-parole sentences, and solitary confinement are common and often marked by racial disparities." "Violence by armed groups and increasing violations by governments have combined to produce the most sustained attack on human rights and international humanitarian law in 50 years. This was leading to a world of growing mistrust, fear and division." I had not thought about the complexities of the War on Terror in this light before. I wish declaring this in an official document automatically made it so. I hope this little post on my little blog might raise a little more awareness for the issue of Human Rights. The process of learning more in order to put it together certainly raised my awareness. Blog Action Day is a free annual event, that has run since 2007. Its aim is to unite the world’s bloggers by posting about the same issue, on the same day, in order to raise awareness and trigger a positive global discussion around an important issue that impacts us all, raises awareness or even helps fund not-for-profits associated to the theme issue. The theme for 2013 is Human Rights. Please follow the #BAD13 hashtag on social media to find more posts from other bloggers around the world!